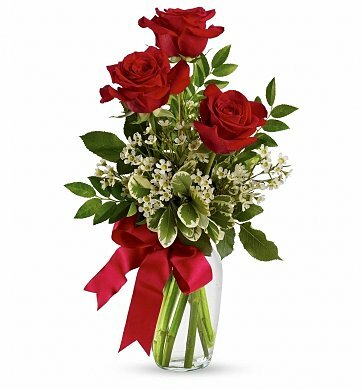 Delight your Valentine with the definitive bouquet of red roses, poised with white waxflower and lush greens. Delivered in a classic vase with a hand-tied ribbon, it's the perfect Valentine's Day offering. Huckleberry, Lush Greenery and more. Standard "Good" Arrangement Contains 3 Roses. Deluxe "Better" Arrangement Contains 6 Roses. Premium "Best" Arrangement Contains 9 Roses. Thoughts of You is a hand delivered gift. These gifts are delivered by one of our local design centers located throughout the United States and Canada. Same day delivery is available for most gifts when ordered before the cutoff time. The cutoff time for Thoughts of You is in the recipient's time zone. Being in Australia I was concerned the order wouldn't be delivered on the right day or in the time frame or even to the correct address, but I needn't have worried. The flowers were delivered immediately, Thank you very much. Will certainly be using you again when needed.